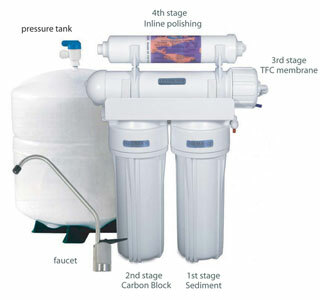 Reverse Osmosis (RO) is a water filtration process in which drinking water, which contains dissolved solids, is run through a membrane. The water then goes to a storage tank and 99.9% of unwanted inorganic componds, sediment and other contaminants are flushed down the drain. This form of water treatment is one of the most effective methods for producing high quality drinking water.